As part of his ad experiment, John Battelle had some amusing run-ins with Google. 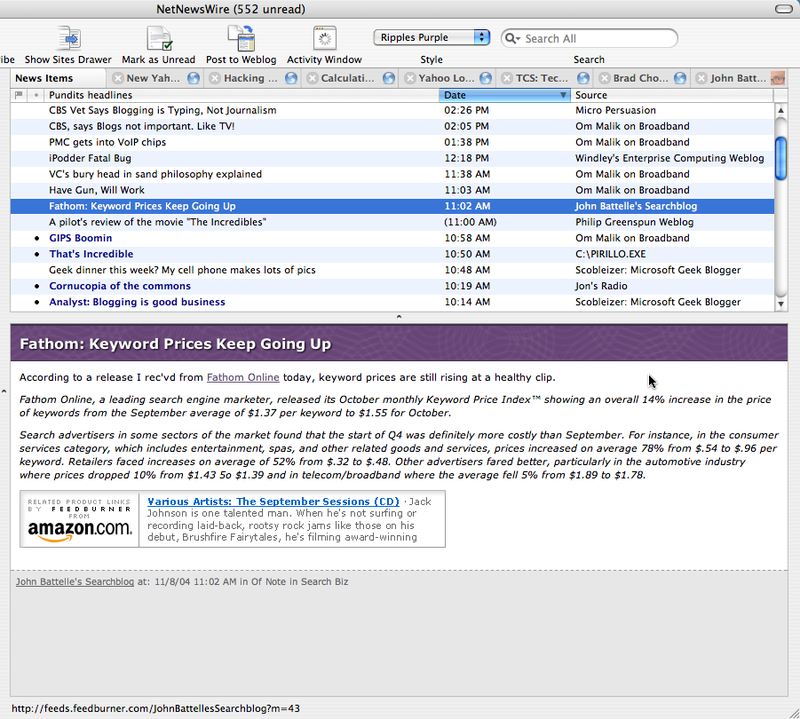 He also recently started using Feedburner to inject ads directly into his RSS feed. The screenshot at the right shows what those look like in NetNewsWire (where I read most of my feeds). The ads are irrelevant--unrealted to the content of the post. Unlike AdSense, they don't fit in with the context at all. The ads are pretty big. That space is not well used. Instead of Amazon.com branding, why not show an album cover there? That might get me interested. Maybe. The bottom line is that if I see this happening on a lot of feeds, I'll probably start trying to figure out how to block the ads--just like we did with the most annoying ads on web sites. Yes, I know they're not animated flash ads that mimic Windows alert boxes, but they just don't seem to fit in with the feed reading environment yet. As much as I hate to give money to Google, AdSense seems more appropriate here. (Then again, Google technically pays me to run ads too.) Besides, ones of Amazon's biggest strengths, their recommendation engine, is not showcased in this form of advertising. That's a pity. I suspect this isn't paying off for John well anyway. So I've been thinking about ads in my RSS feeds, mostly because I've turned on full feeds. I use mostly google ad-sense for advertisements. There's a problem with them that runs a bit deeper. Google AdSense uses the entire page for generating ads. Often times things that have no relevance to the content are used as the adwords. In my case obfuscated, rss and xml are the main culprits. What if there was a way to specify for a group of ads which part of the page was relevant, possibly using a div tag's class or ID to specify which blocks of text to look in. This would make for better ad relevance. What does this mean for RSS feeds? You could create a div in your RSS feeds that is unique to each article and place an ad within that article specific to that feed. Without this the ads will use the entire feed as the source for adwords and therefore an ad on an article about cats might pick up some adwords from an article about John Kerry. Hey Jeremy. You're right about the context, as was evidenced by the Van Halen ad link on John's initial Feedburner post (insert bad joke at our expense here). The fact is that the Amazon Web Services engine that we're using to generate these can work magnificently well with product based feeds but has a much harder time hitting the mark on concept/thought based feeds like John's. Fair enough, we should provide other alternatives for the myriad types of feeds out there, so that the AWS service isn't forced into uncharted waters. Also, points noted on the sizing and space - there have been other reactions as well that we're considering. What we need to do is provide the right suite of services that balances "total publisher control" against subscriber experience. We'll either get it figured out asap or get pushed aside. There's a bigger issue than relevance/irrelevance to the content. Amazon ads only work when the user is in "buy" mode. Unless the publisher is talking about the item, whetting my appetite for it, I'm very, very unlikely to click that link. Whatsmore, the chances that I'll go from clicking though to buying it (which is the value to the publisher), right then and there, is extremely slim. When I'm reading blog content, I'm not in "buy" mode, I'm in "info" mode. I think this is an important distinction that will play a big part in how ads in feeds best get implemented. I absolutely hate the feedburner ads. AdSense doesn't bother me. AdSense clones, even if they are not quite as relevant, don't bother me. Big banners are outdated. If feedburner doesn't lose them, they will be blocked. One can always switch to Firefox, install the AdBlock Extension, which is a freaking lifesaver. What happens when you try to merge Google Ads and Amazon Ads? Blogs are a big way to monitize your traffic and grow your side revenue. Amazon ads does not work that better as Google Ads in terms of revenue, and both have a different turnaround money involved, becuase Google is Ads and Amazon is products. AmazonAds is a fast and easy way for website publishers of all sizes to display Amazon unobtrusive product ads on their website's content pages and earn money. and the best part is that this service is FREE to use and AmazonAds does not charge for this service. Your revenue goes directly to your AmazonAssociate Account. Please Visit: http://www.amazonads.net for more information. I recently switched to RapidFeeds from feedburner due to the amazon ads displayed. 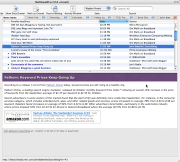 RapidFeeds is a Ad-Free service which publishes and also tracks your rss feeds... It's free of cost and easy to use.